A McKinsey study affirms that 62% of the executives believe that they will need to retrain or replace more than a quarter of their workforces between now and 2023 due to advancing digitization and automation. The question is always of survival. Keeping people’s skills in sync with fast-changing markets is the biggest challenge of our times. And we are not ready — Our workforces are not ready. Our leaders are not ready. A McKinsey study affirms that 62% of the executives believe that they will need to retrain or replace more than a quarter of their workforces between now and 2023 due to advancing digitization and automation. With this, there is the unequipped workforce that is unprepared to navigate the unprecedented pace of change in the business and organizational ecosystems. We are grappling with the terminal illness of skills gap. And while many are researching on solving the challenge, it all comes down to “learning” as the antidote to the skills gap epidemic — learning that is built into the work that employees have, and not something that they do separate from work. Today, learning has transitioned from a one-time, standardized setting and has evolved to a 24/7 process. But this too will change eventually. It is becoming complicated and messy by the day. It’s not just enough for organizations to offer support to their employees on their learning journey; they have to create the right environment for employees to take ownership of what and how they learn. But are learners and employers keeping up? Despite the realization that learning needs to be on-the-job, are organizations really tapping into what employees are learning, what skills they are building, and how they are working to prepare for their future careers? Do organizations really hold the power to shape the future of learning and challenging the status quo in learning? 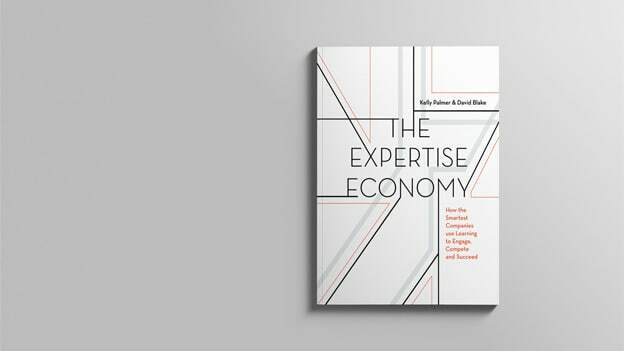 Kelly Palmer and David Blake’s book The Expertise Economy ‒ How the smartest companies use learning to engage, compete, and Succeed is not just a book about how the smartest companies are using learning for engagement, gaining a competitive edge and succeeding, but a dossier on how skills are the currency of the expertise economy and how organizations can take an integrated and continuous approach to learning, and hire for skills and expertise, and not university pedigree, as the future of work changes. The authors examine the traditional importance rendered to the college degrees and contend that a university degree no more guarantees job security and speaking to the skills and abilities by referring back to a degree alone becomes outdated as one develops new capabilities and skills over the course of one’s career. Constant upskilling and reskilling of those entering the workforce and those that are already in the workforce is the key. The book is divided into eight chapters that follow a logical sequence and explain conspicuously the patterns of learning, learning as a competitive advantage, embracing personalized learning, combating content overload, understanding the power of peers, succeeding with the right technology, analyzing skills with data and insights, and making expertise count. The book ends with a chapter on “The Future Is Already Here” which gives compelling short commentaries on careers that haven’t yet been invented, skills for the future, gig economy, baby boomers not leaving the workforce and finding a purpose in life through work, tacking the skills gap, and what universities, companies, and individuals can do to prepare for skills as the currency of the expertise economy. To premise of the book rests in this quote by the American philosopher Eric Hoffer, “In times of change, learners inherit the earth; while the learned find themselves beautifully equipped for a world that no longer exists.” While the book deals with the complex nuances of the future of work, the skills required to navigate a future unknown, and the epicenter of learning, the concepts are dealt with insights and perspectives of key leaders of top companies like Google, LinkedIn, Airbnb, Unilever, NASA and MasterCard along with thought leaders in business, learning, and education like Sal Khan, Todd Rose, Clayton Christensen, Daniel Pink, and Whitney Johnson, that are elucidated and concluded in uncomplicated and intelligible manner. Every chapter in the book is replete with practical and actionable points — the real-life analogies in the book prompt the readers to think about their own experiences and correlate to what is mentioned in the book. The book is not just another book on learning, business or management. The authors, David Blake, and Kelly Palmer offer an intricate blend of research, practical anecdotes, and real-life pointers for a thought-provoking and engaging reading experience that augments intelligence on the themes dealt in the book. It is an inspiring, instructional and purpose-filled read! More insights by David Blake, click here.